The Jura "Cool Control" 34 oz. 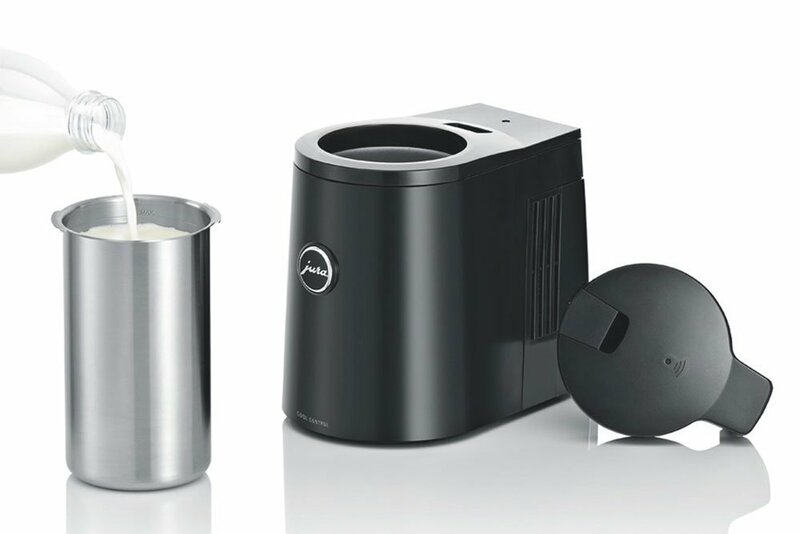 milk cooler is best way to keep milk cold all day while remaining available for use in your Jura automatic coffee center. Keeps milk at the proper temperature for just pennies a day. Always fresh, never frozen. Once a temperature of 4°C / 39.2 °F has been reached, the intelligent device then keeps the milk in the optimum temperature range – this not only prevents the milk from accidentally freezing, but also helps to save energy. The high-quality stainless steel container with a capacity of more than one liter can be easily removed, refilled, cleaned or stored in the refrigerator if necessary. The Cool Control is not only functionally appealing - its typical JURA design also rounds off the machine optically. Life changing accessories for our jud we love it! It works great. The on button and on light are way in the back, hard to see and I often forget to turn it on spoiling the milk.